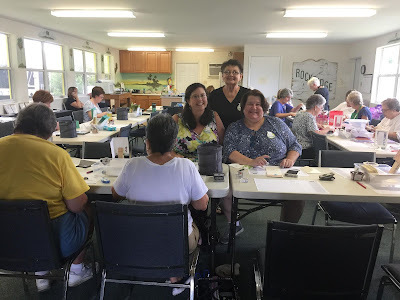 This month's NC Demos Blog Hop theme is "Summertime", I decided to show you a few events I have been working on this SUMMER. 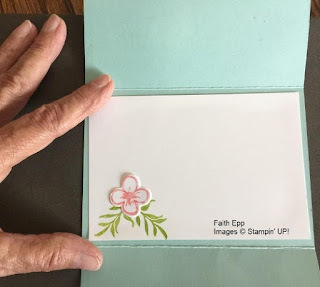 My first sample is one from Stamp Camp my team member Faith has been working on. 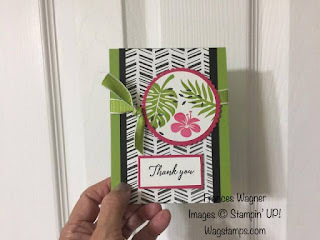 I love the colors (Pool Party, Granny Apple Green and Flirty Flamingo) and the way it folds together. Faith used the Bouquet Blooms Bundle to make this cute card. 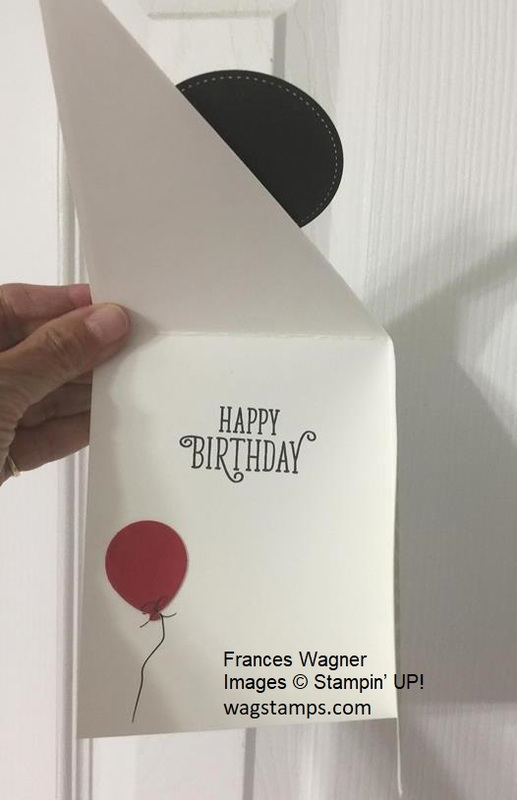 The inside is just a cute. Thank you Faith for sharing your talent with us. Each month we play bunco and the prizes are chosen from the Stampin' UP! catalog. 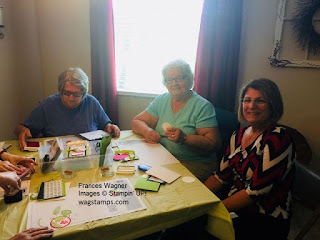 We begin with dinner and then we make a quick card and then play bunco. We all look forward to playing and getting together. 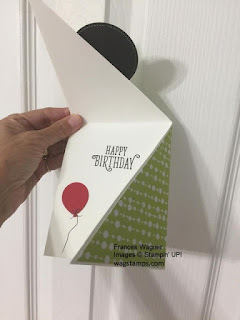 This month I used part of my paper pumpkin kit but used an alternative card so I could get 12 cards from it. Everyone enjoyed making it and it gave those that already get Paper Pumpkin a different idea of how to use their kit. 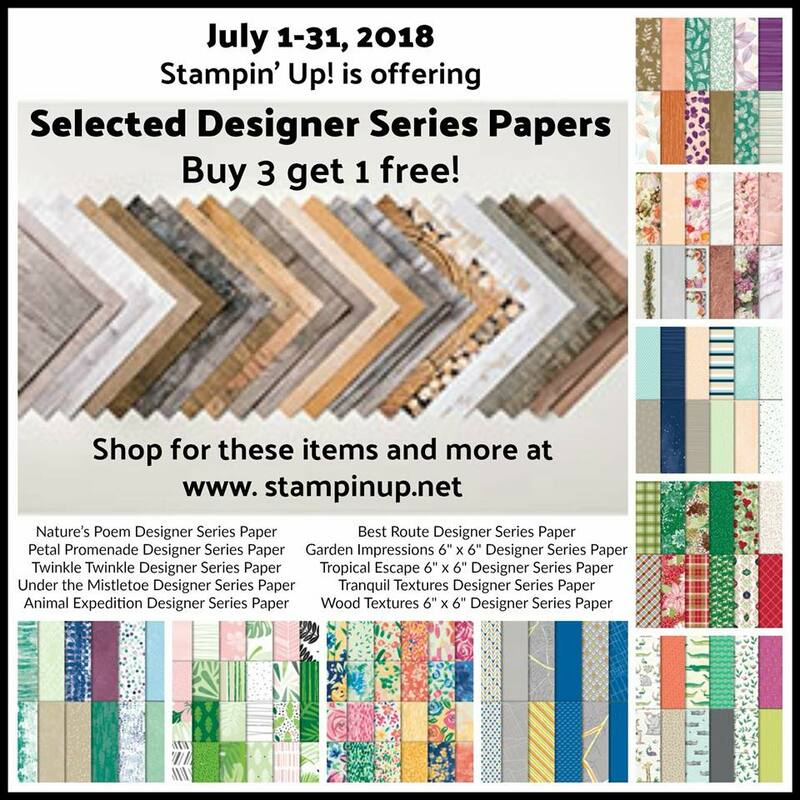 If you don't already receive the paper pumpkin kit and and are a new subscriber then you will want to order before Aug 10 because there is a great special to get the first month 1/2 off. Make sure to Click HERE to sign up today for your discount and use the promo code BLOOM0818 in order to receive the discount. Below is the alternative card we made. 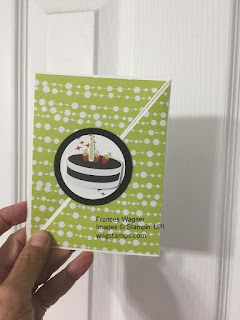 Carolyn Pollmeier had a fun party this month and this is the card we made. 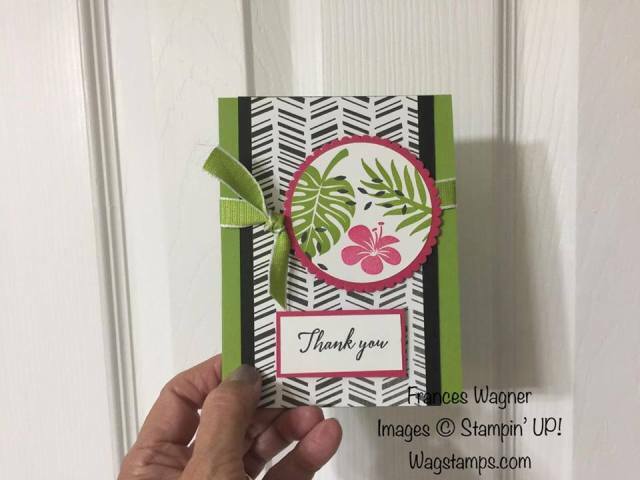 It is so us- Tropical Chic from the new catalog. The girls had a great time making the card and I demoed the Stamparatus! Thank you Carolyn for opening your home to a fun girls afternoon out. I will share more later. I know you are anxious to see what Toni has to show us. Supplies used in first card. JULY SPECIALS REMINDER: CHECK IT OUT. 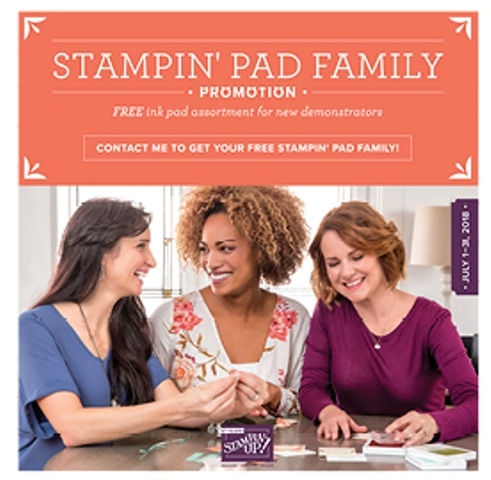 Don't forget you have a few more days till the end of July to take advantage of the 10 FREE STAMP PADS and $15 in product when you buy the kit for just $99 click here. CHECK IT ALL OUT...... CONTACT ME IF YOU HAVE ANY QUESTIONS. 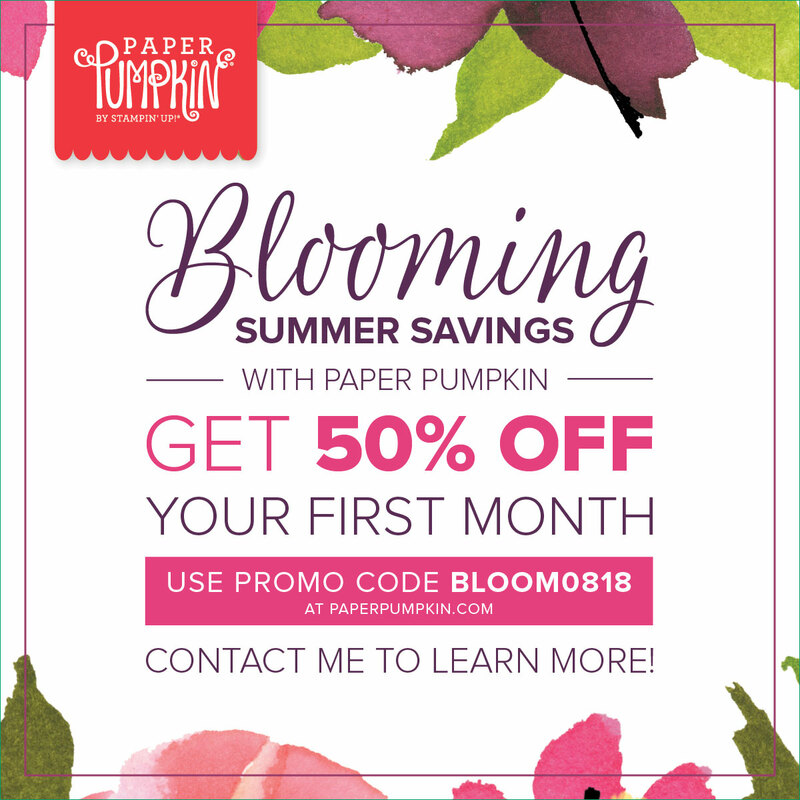 Paper Pumpkin is offering a one month half off Summer Savings for new subscribers only- July 11–August 10, 2018 for first time. You receive everything you need, except adhesive, to complete your projects each month. I am adding a Paper Pumpkin alternative to my classes this Fall Bring your kit and I will show you alternative projects you can make using items in your kit. 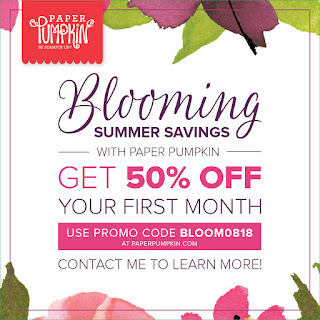 Click HERE to sign up today for your discount, make sure to use thee promo code BLOOM0818 in order to receive the discount. ORDER NOW FOR GREAT INCENTIVES FROM ME! Hello everyone! I have a really fun incentive for you FOR THE REST OF JULY. I am working hard to reach a sales goal before September 30 ($200K in career sales!!) and so I've decided to reward you the rest of July! Please make sure you read the details below and let me know if you have any questions!! 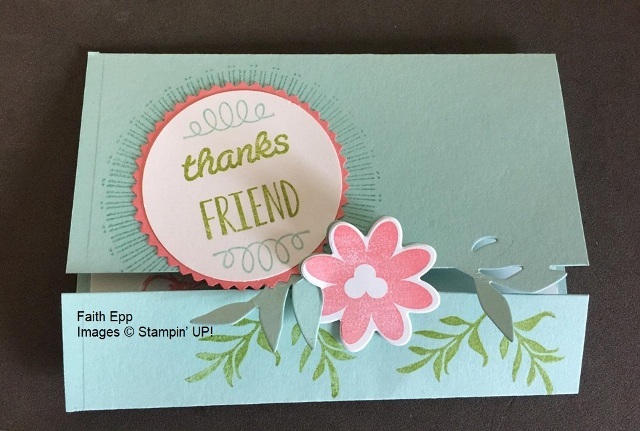 • All online Stampin' Up! product orders between July 18 and July 31 are eligible. • Order anything from my ONLINE STORE HERE! • All items are cumulative! 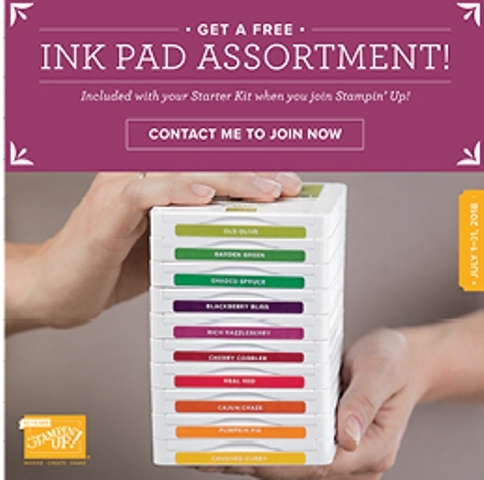 Spend $125 and get all four free products! 3. $100 earns you the jewels, the Shammy and Paper Snips! • I will order all the free items on August 1st and get them in the mail to you the as soon as I receive them. 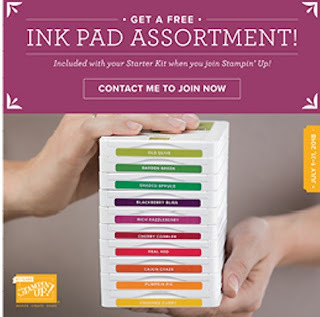 Don't forget not only do you have this special from me but you have 7 days (till September 30th) to sign up on my team to get your choice of FREE ink pad families plus $125 in product all for just $99.00. FREE SHIPPING TOO. 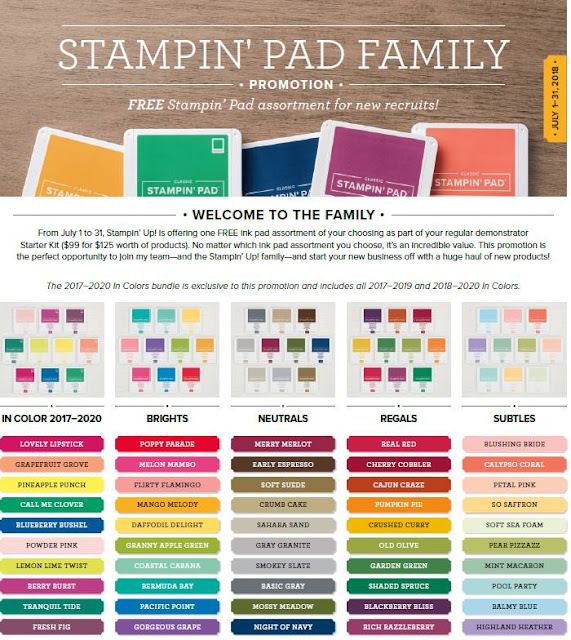 Which INK PAD FAMILY will you choose? Thanks to those that have already signed up this month. I am excited to have you join my WagStampers Team. 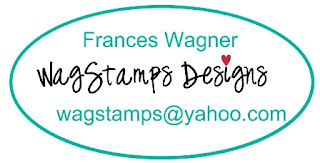 Labels: Frances Wagner, FREE product, Join my team!, Stampin' Up! 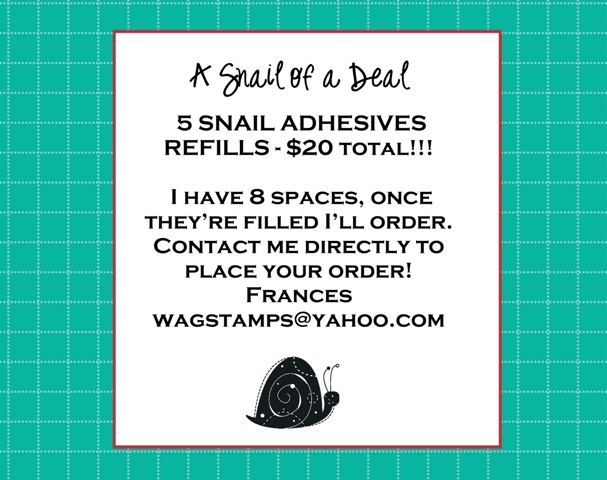 Time for a SNAIL OF A DEAL! 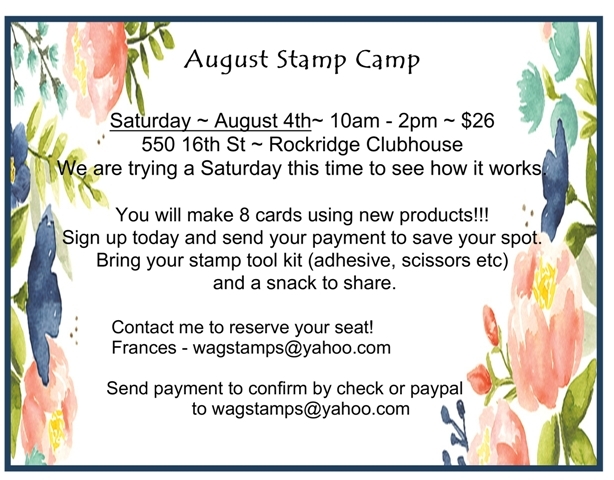 Hey Stamp Campers, we are trying something different for August. We are stamping on Saturday, August 4th from 10am- 2pm. Make sure to let us know if you are coming so we can cut paper for you. 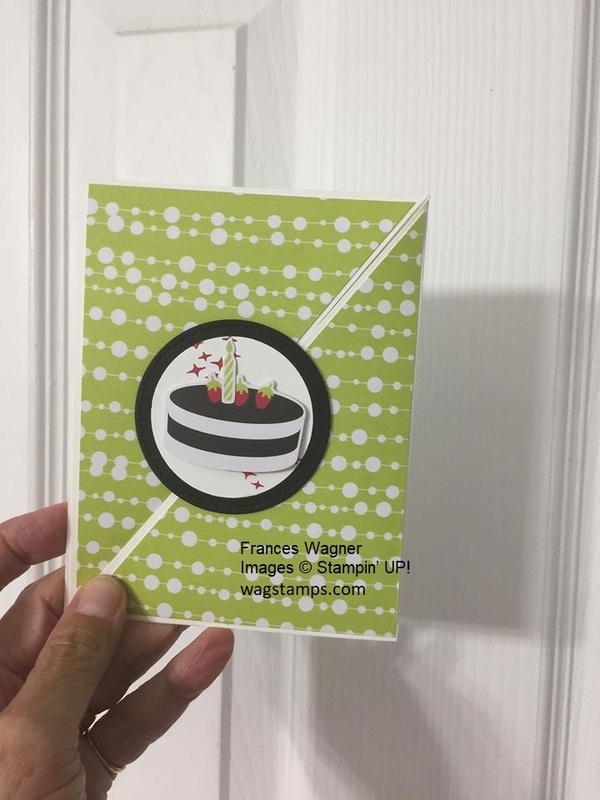 We have all ordered new stamp sets for you to create fun cards with us. 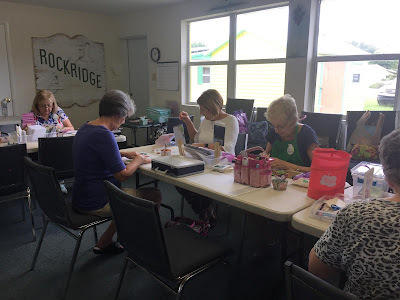 We just had our July Stamp Camp and we had a lot of fun. I always create cute name tags and these are the ones I made for July. I will let you know what I come up with for August. 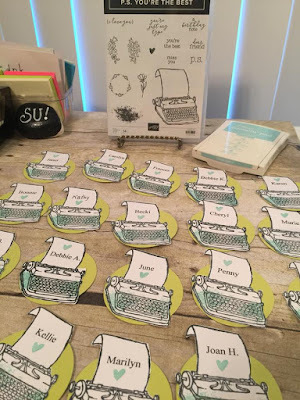 I do love typewriters, it reminds me of the first book my husband wrote on a typewriter before we had computers (yes I know I am telling how ancient we are!!! 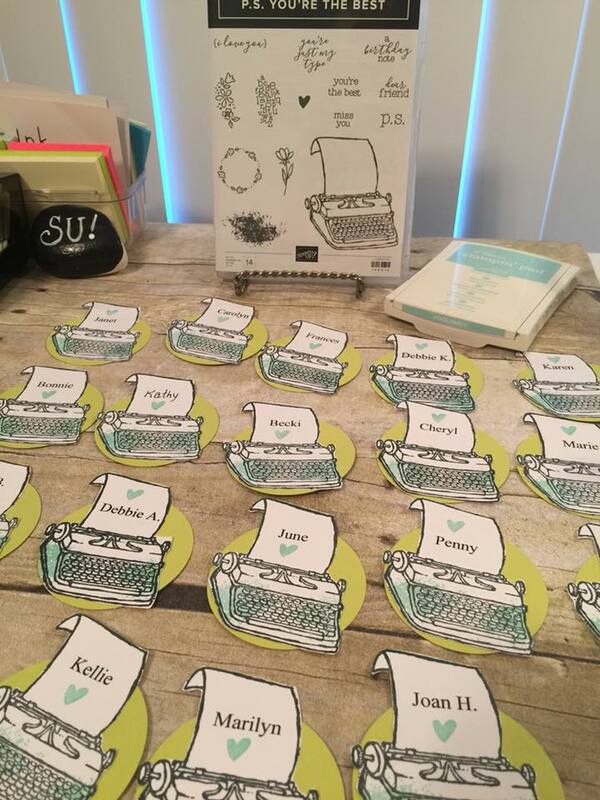 :) Join us at our August stamp camp and get your cute name tag. Click photo below for details. Fabulous Joining Offer From Stampin' UP! 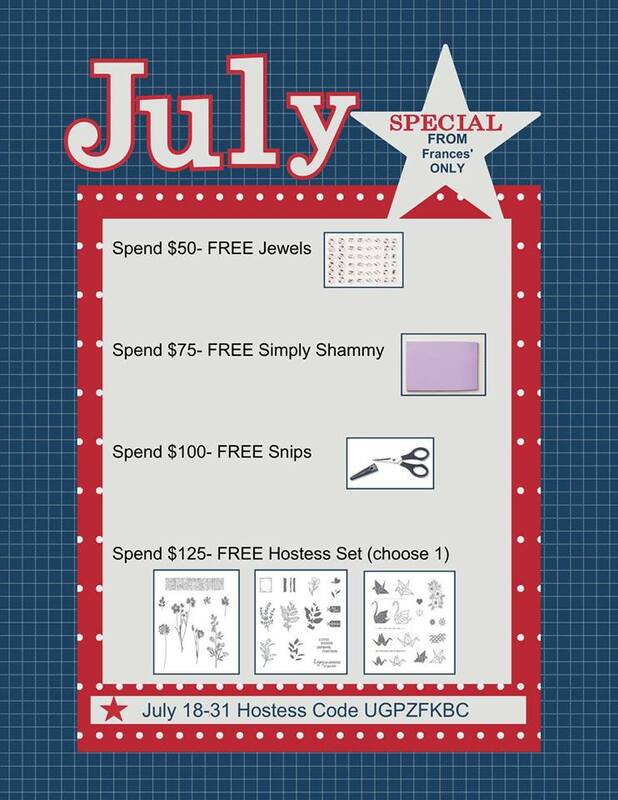 Start the fireworks early and take advantage of this great recruiting promotion for the whole month of July. Join my team and Stampin’ UP! July 1st- July 31th and receive FREE INK PAD FAMILY, in addition to the usual $125 in products of your choice, catalogs, a free paper pumpkin kit and FREE SHIPPING ALL FOR $99 You are going to love the new style ink pad. 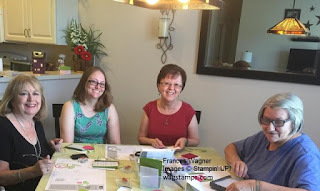 l have team members across the US and would love to have you join us. We meet in person for those close by and on line for those far away. 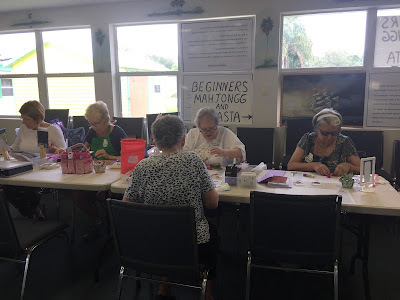 We have lots of fun and always find time to stamp and travel together. 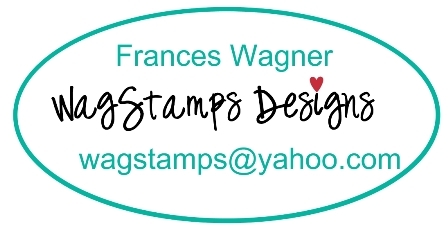 If you join now you can register to go to the FABULOUS ON STAGE CONFERENCE IN NOVEMBER to celebrate Stampin' UP! 30th year. 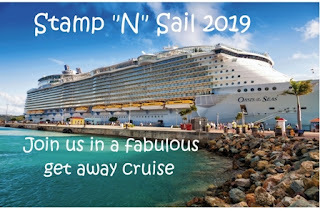 I know you will love to join my team on a fun trip to Orlando, FL so all you have to do it CLICK HERE and you will be on my Stampin' UP! website to join my team. STAMPIN BLENDS ALCOHOL MARKERS ARE HERE!!! GREAT NEWS!! Especially for my friends that love to color. 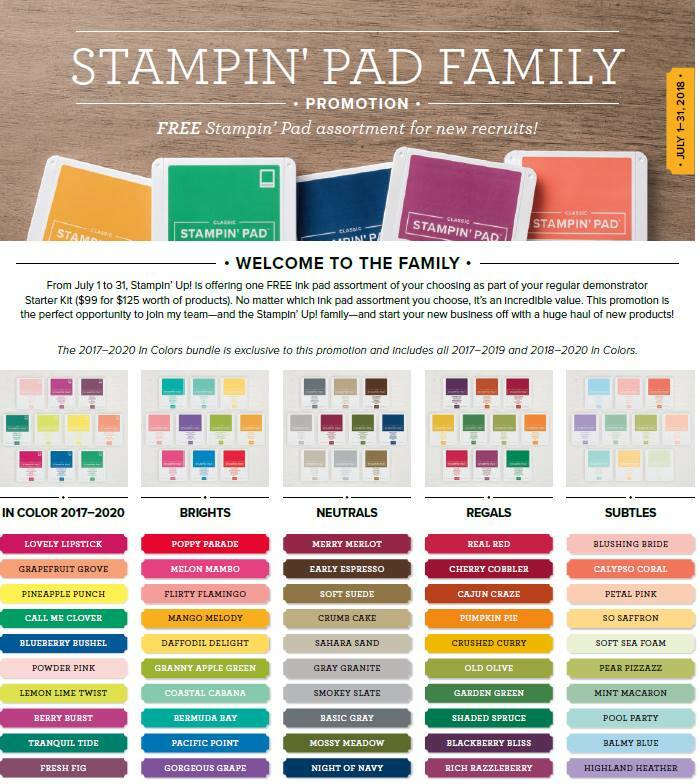 The Stampin' Blends are now available in the new colors. I will be placing an order tomorrow, let me know if you need anything. 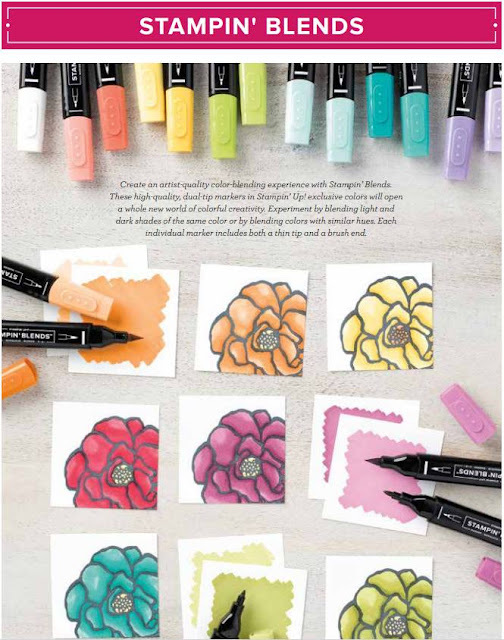 You can view the colors on Page 205 in the Annual Catalog. Use host code # 2K7C633C to order on line when you order $50 or more for a gift from me. What an amazing month July will be. Check out my JULY CLASS SCHEDULE HERE! Or on the events page above at the top of my page!